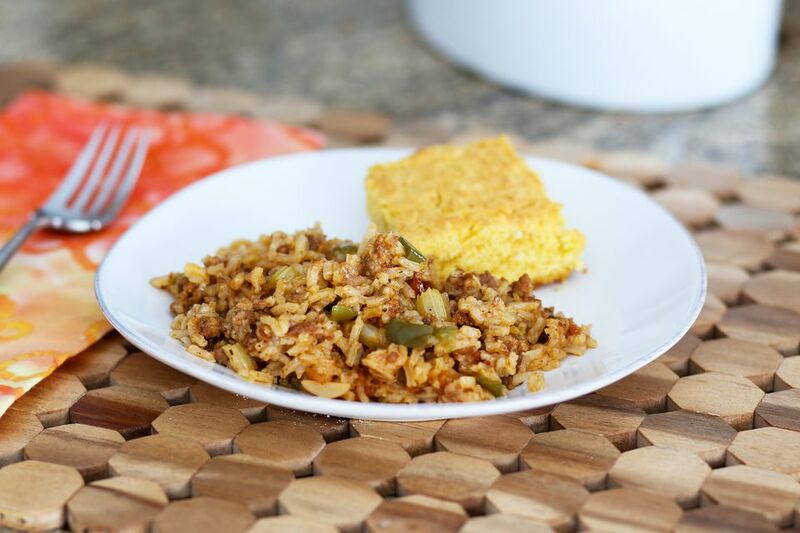 This is a flavorful rice casserole with sausage and slivered almonds Use bulk fresh chorizo in the casserole pictured, but a regular or spicy breakfast sausage, turkey sausage, or Italian sausage would add flavor as well. It's a Cajun blend of ingredients, starting with the "holy trinity" of celery, bell pepper, and onion. Feel free to tailor the ingredients to suit your taste. Add part red bell pepper with the green for extra color, or add some shredded carrot to the dish. Just add cornbread or biscuits and a salad for a delicious, satisfying family dinner. In a heavy skillet or saute pan over medium heat, cook the sausage, stirring, until browned. Remove the sausage to drain, leaving about 3 tablespoons of fat in the pan. Cook the celery, green pepper, and onion in the remaining sausage fat until onion is translucent. Stir in the garlic and cook for 1 minute longer. Spoon the browned sausage, vegetables, and almonds into a 2 1/2 to 3-quart baking dish. Add rice and the chicken broth; mix well. Cover and bake in the preheated oven for about 1 to 1 1/2 hours, or until liquid is completely absorbed and the rice is tender. *If using homemade broth or stock, taste the dish and add salt, as needed.